“Rising Dragon” has been painted as an auspicious work inspired from ancient times. Using the “Unryu-zu (a folding screen along with the painting of a dragon in the clouds)” painted by Sotatsu Tawaraya as a motif, Platinum meticulously applied “Kanazawa-haku Momi Chirashi” technique on each pen. By utilizing a modern “makie” technique, Platinum has created a distinguished and sophisticated “Rimpa” style fountain pen. The base is Kanazawa-haku using Momi Chirashi, a traditional technique that after a gold leaf is extended to a thin sheet, it is torn into smaller pieces. 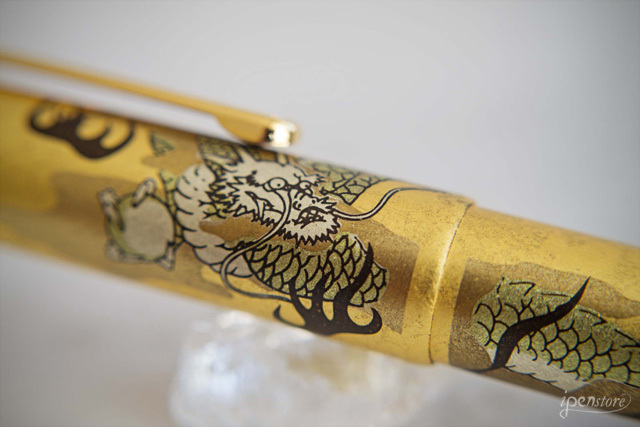 These are then pasted to the barrel of the pen, giving an elegant glow that reflects light with depth and adding a lively motion to the dragon, which makes a remarkable, one-of-a-kind fountain pen. Made in Japan.